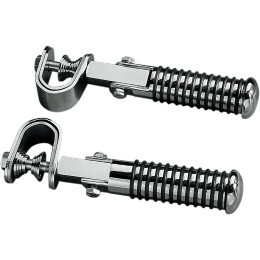 New replacement and accessory pegs, hiway pegs, and floorboards can be found below. Scroll down to see all models. All chrome steel floorboard kit for any GL1000 '75-'79 or GL1100 '80-'83 comes with all parts to mount including toe-heal shifter and kickstand extension. Full size rubber footmats on boards and shifter pedals.